The friends and well-wishers of a transgender woman, whose death in 2015 garnered international attention, have set up a new award at Ryerson University aimed at helping trans students of colour. When Lali Mohamed thinks of his friend Sumaya Dalmar, he often recalls the last New Years Eve they spent together, sitting around with friends, laughingly making resolutions. "I'm going to meet a guy and buy a house and move to suburbia," Mohamed recalled his friend saying. "We all laughed." To most, it would have seemed ordinary. But for Dalmar, a black, Muslim, transgender woman, it was a dream that would ultimately remain unfulfilled. In February of 2015, Dalmar was found dead at the age of 26 in a home in Toronto's Danforth Village. Three years later, the details of her death remain mired in the shadows. That obscurity, for those who knew her, bears stark contrast to Dalmar's bold personality. "She lived her life in a very public way and anybody who encountered her was immediately moved by her insistence to be exactly who she wanted to be," Mohamed said of Dalmar. "I think people are pushed into closets, people are pushed to the margins but Sumaya refused that. She refused to be beholden to other people's ideas," he added. That fearlessness is something Mohamed and a group of Dalmar's friends hope to immortalize with a scholarship at Ryerson University to help transgender students of colour pursue their educational goals. It's a cause he says she would have cared deeply about. Before her death, Dalmar was about to begin working with the education department at the 519, Canada's largest LGBT community centre, Mohamed said. Dalmar faced a combination of transphobia, Islamophobia and anti-black racism, he explained. She moved to Vancouver, fleeing Somalia's civil war with her family when she was three years old. She eventually came to Toronto to begin her transition, he said. After her death, Mohamed began collecting funds with Dalmar's other friends to set up an memorial award in her name. Initially, he says, they waited for the details of her death before establishing the prize. But they've since lost hope in getting closure. Police investigated Dalmar's death in 2015 under a cloud of suspicion from the community, concluding their investigation in May of that year. An autopsy proved inconclusive. Her death was never ruled a homicide. There was no evidence to indicate the death was suspicious," Toronto police spokesperson Meaghan Gray told CBC Toronto, adding that police from 55 Division conducted a "thorough investigation." Toxicology tests were done and returned to investigators, but police have never released a cause of death "to protect the privacy of the victim." 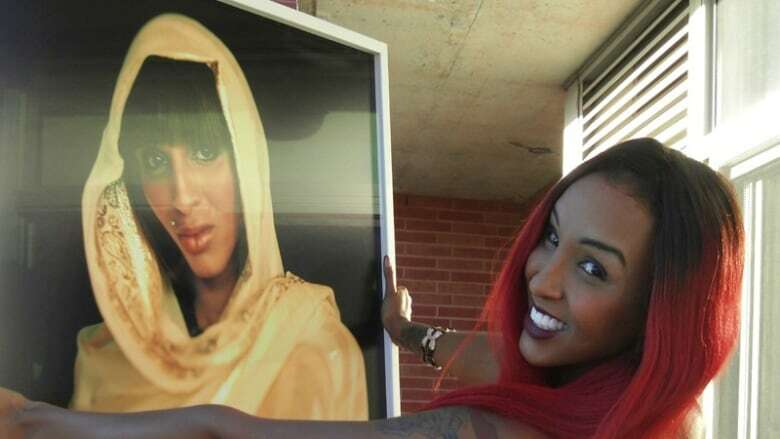 It's a refrain all too familiar for Mohamed, who felt some of the same frustrations come up in the community this past summer with the death of another transgender woman, Alloura Wells, whose funeral is set to take place Tuesday. "There was this indifference like they just didn't care about black, trans women," Mohamed said. "For several months I would call the Toronto Police every week and they would just deflect my questions." Wells went missing from the Church and Wellesley area last July. A month later, residents stumbled upon the body of a transgender woman lying on the ground near a tent in Rosedale Ravine Lands Park, an area Wells's friends say she frequented. But the body wasn't identified as Wells until November when she was reported missing. "The recent case of Alloura Wells reminds us that institutions that are there are there to serve and protect us doesn't necessarily care for us the same way they do other communities," Mohamed argued on CBC's Metro Morning on Monday. Wells's father, Michael, has previously said he felt his oldest daughter's disappearance wasn't taken seriously by officers. Ryerson University's Alan Sears, one of the professors responsible for administering the award in Dalmar's case, says the idea was to "benefit individual trans students of colour, and focus attention on the contributions of racialized trans communities." "Trans people in Canada, particularly trans people of colour, face particular barriers to employment, housing and education," explained Shaila Cavanagh, a gender and sexuality professor at York University. The hope, says Mohammed, is that the example that Dalmar set through the life she lived will inspire other who share her struggles to realize their own dreams. "She modelled to other women, particularly other trans women, what was possible," said Mohamed, "in a world that would rather disappear and erase trans women."